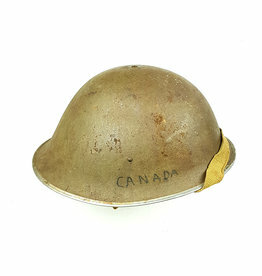 Canadian Battledress worn by Sergeant Robert E. Adams of the North Nova Scotia Highlanders. The tunics is dated 1944 with paybook. Canadese High Top Boots. The boots are in good condition, shows traces of usage. Original laces present. The leather is still in good supple condition. The boots are dated 1943. The boots are in used and worn condition, shows traces of usage. Original laces present. The leather is still in good supple condition. The Skeleton Assault Jerkin was a simplified version of the Battle-Jerkin, It was made from the same canvas duck material as the Battle-Jerkin.